Let's talk about how to conduct an energy assessment using GEMS! Once a business says ‘yes,’ you’ll use GEMS to complete their energy assessment. Here’s how GEMS works. Go to http://gems.greenimpactcampaign.org/ on your computer and login using the account information that was emailed to you. Under the Pending Surveys tab, note the 4-digit Reference Code that corresponds to the business that you will be surveying. If you’ll be using the GEMS Survey Express print-out (download below), you will be able to complete the survey at any time and then you will need to follow the above instructions after performing the survey and then input the survey answers into GEMS. 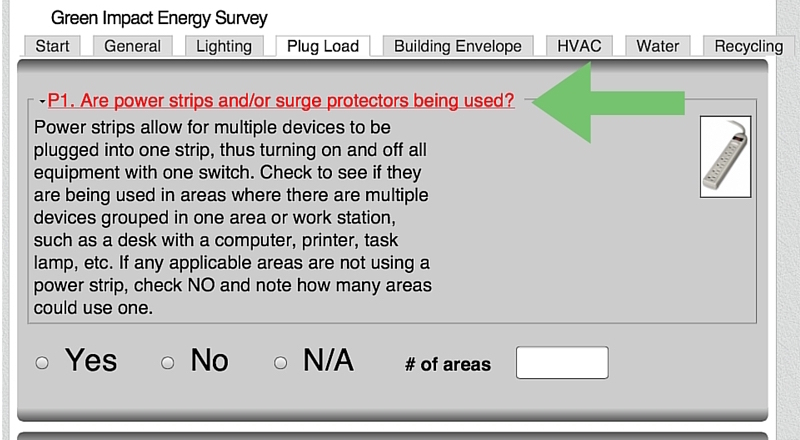 The survey is broken into sections: General, Lighting, Plug Load, Building Envelope, HVAC, Water, and Recycling. Tabs at the top of the screen indicate the sections. The highlighted tab indicates the section you are currently working on. Tap another tab to view that section. Use the questions to guide you through the business’s space, observing what is being asked and asking the business representative any starred* questions or any questions you are having trouble finding. If you are unsure of what is being asked in a question, tap the question text to view further descriptions on how to answer the question. For each question, select Yes, No, or N/A based on your findings. When specified, count and input quantities. Complete all questions in a section and then tap the Save button at the bottom of each section before proceeding to the next one. 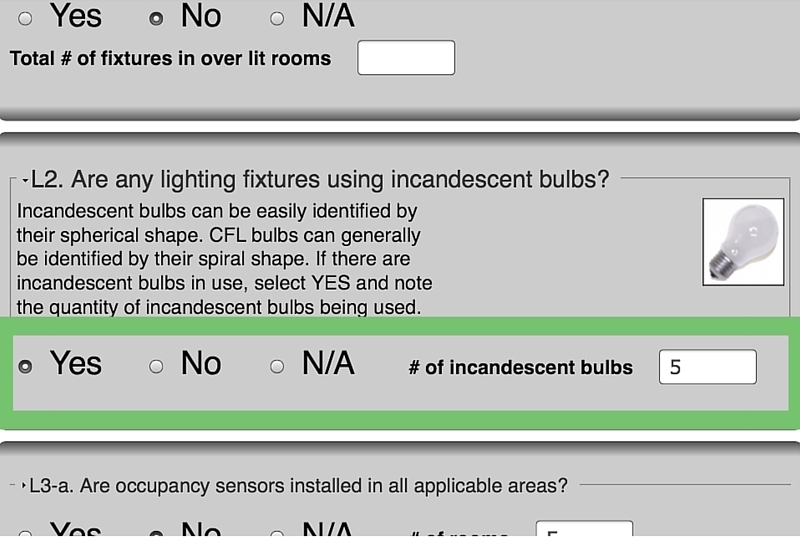 Now that we know how GEMS works, let’s go through some of the questions and learn what the survey is assessing in a building. Can more than one person conduct an assessment? Yes. 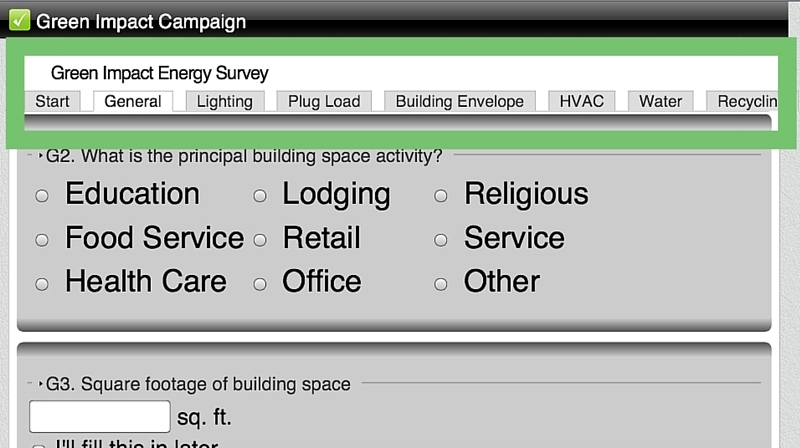 If you are conducting the survey as a team, each person can work on one section of the survey independently. This will lock out anyone else from that section so they don’t duplicate efforts. 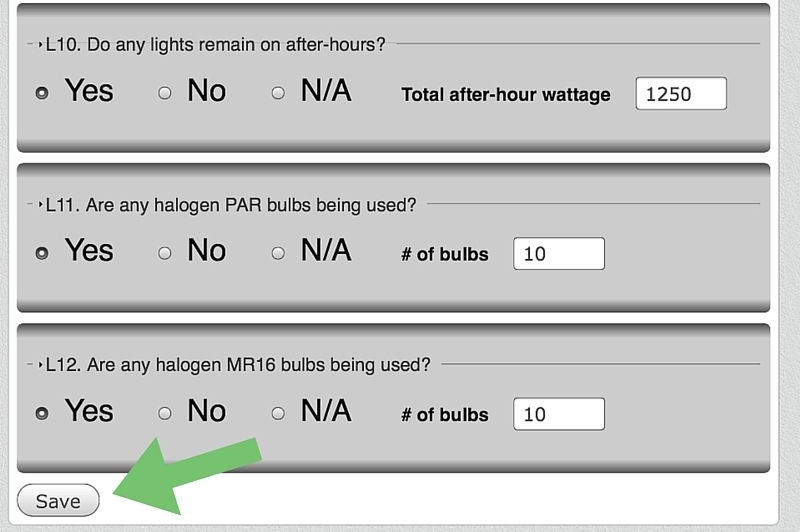 Likewise, if you’re using the pdf print-out, you can divide and conquer the questions. Which questions will I need to ask the business representative? Most of the questions will be observational, meaning you’ll be able to answer them just by walking around and looking for yourself. Questions that are starred (*) indicate those questions that might not be observational and that you’ll have to ask the business representative. It can be good to ask all of the starred questions at once either at the beginning or end of the survey.